I had included this in Part 3, but I removed it because there was some question about size of the Temple in the Creation Week Chart below. I was able to verify the size, and the chart is correct. Some Temple information sites leave out the 10 cubit porch, making it only 60 cubits long instead of 70. 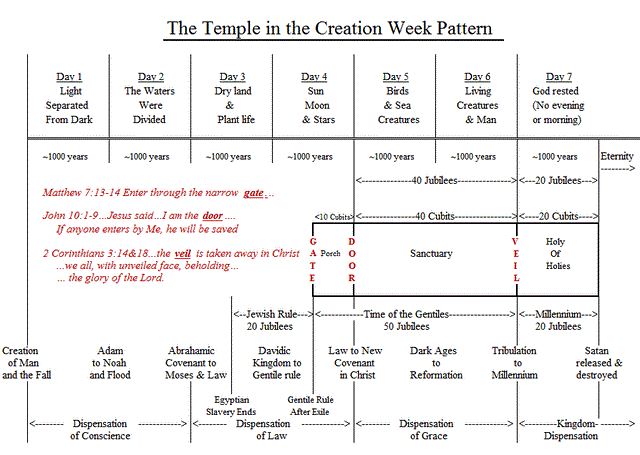 Now that I have that cleared up, I want you to see how the Temple foot-print inside the Creation Week Pattern seems to confirm that we are approaching the end of what is known as The Time of the Gentiles, after which, Israel sees her last days as told in Revelations. Remember this chart from last week? The Temple dimensions are a key to the End of the Time of the Gentiles, after which Jesus returns and also confirms the three numbers that map out Israel's life as a nation, from her beginning until her Messiah returns. 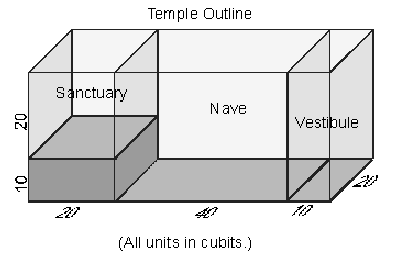 Temple dimensions: we have 70 cubits from gate all the way to Eternity. The Holy of Holies represents the 1000 years we live under Jesus' rule. Each of these cubits stands for a Jubilee (50 years). Look under the Temple, you see just how long the Time of the Gentiles is. You see that it ends when the 1000 year reign of Jesus begins. Just what is this Time of the Gentiles? It is the years that Gentiles rule on Temple Mount. The Gentiles have had rule on Temple Mount now for a total of almost 2500 years. The Time of the Gentiles ends when Jesus removes Antichrist from Temple Mount where his temple currently is placed. This is significant because Bible prophecy and prophecy teachers have long said that Jesus returns when The Time of the Gentiles ends! It's the Temple dimensions in Jubilee years that shows us exactly when that is! We are almost there. The fact that the Temple is 70 cubits long; I believe confirms that the man/ nation called Israel has 70 years and then destruction begins. By destruction I mean the Magog War, and the last 7 years. On the chart, you see only 2 of the pattern numbers in the Temple footprint, the 70 and of course the Jubilee 50. but, the 120 is also part of the Temple dimensions. According to the Jewish Virtual library site: The highest point on the Temple that King Solomon built was actually 120 cubits tall. That puts 120 in the dimensions as well. Also, associated with the Temple was the Great Sanhedrin, entrusted with the preservation of Jewish life, the total composition of the Anshei Knesses HaGedolah was of 120 members. Another association of 120 with the Temple: at the inauguration of Solomon’s Temple, 120 trumpets were sounded. Today, Israel's Knesset, the legislative branch of Israel's government has 120 members. In fact, the Church, Jesus' followers, the ones who go through that narrow gate, and through Jesus the door into the sanctuary and through the veil, (of the Temple on the chart) began in an upper room with 120 people. Here, in the Jewish Temple dimensions, just as in Israel's significant dates, we have the three numbers, 120, 70, 50. Are you coming into the light yet or are you still in the dark? “The number 120 signifies the passing away of the "age of the flesh" and the beginning of the "age of the Spirit”. 120 were gathered in the upper room when to the Holy Spirit came upon them. Birth of the Church. PETRA is 120 SE of Jerusalem, Petra will be the hiding place in the Tribulation. There are 120 Jubilees and then Jesus takes over.